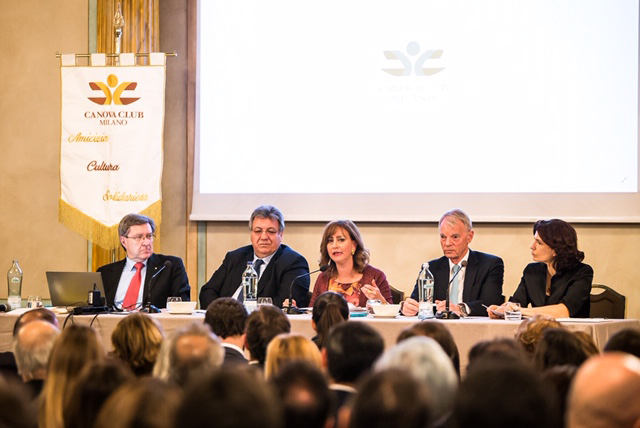 ABOVE: CIBJO President Gaetano Cavalieri (second from left), at the podium during the Conova Club meeting on sustainability in Milan on April 10, 2019. He is joined on the podium by (from left) Professor Enrico Giovannini; moderator Laura La Posta, Editor in Chief of Il Sole 24 Ore; 2001 Nobel Prize Laureate Professor Andrew Michael Spence; and Alexia Giugni, Managing Director of the DWS Group. Speaking yesterday to members of the Canova Club, an exclusive Italian association of opinion leaders and decision makers from the country’s economic, finance and business communities, CIBJO President Gaetano Cavalieri has described what he termed as an essential shift in thinking in the jewellery industry, where the attitude towards artisanal and small-scale mining is changing from it being considered a challenge, to being more of an opportunity. 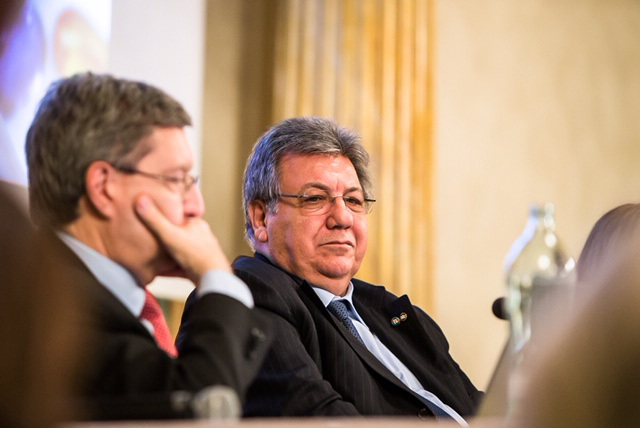 CIBJO President Gaetano Cavalieri during the Conova Club meeting on sustainability in Milan. It featured a panel that included Dr. Cavalieri; Enrico Giovannini, a professor of economic statistics at the University of Rome Tor Vergata, who in 2013 and 2014 served as Italy’s Minister of Labour and Social Policy, and between 2001 and 2009 was Director of Statistics and Chief Statistician of the Organisation for Economic Co-operation and Development (OECD); and Andrew Michael Spence, a Canadian-American economist and labour specialist at New York University, Stanford University and the SDA Bocconi School of Management in Milan, who in 2001 was the recipient of the Nobel Memorial Prize in Economic Sciences. The moderator of the event was Laura La Posta, Editor in Chief at Il Sole 24 Ore, a leading business daily in Milan. In his wide raging overview of the economic and social role of the jewellery sector in developing countries, Dr. Cavalieri said that some of the traditional definitions of sustainability needed to be adjusted for an industry where many of its raw components are mined. However, noted the CIBJO President, There also parts of the jewellery business, where not only economic activity is sustainable, but so is the product – environmentally as well as socially and economically. “These most often these involve biogenic materials in a marine environment, where sustainability is made possible through aquafarming, such as with cultured pearls, or controlled harvesting, as with precious coral,” he stated. Over the past several years there has been been a strong move towards the adoption of uniform standards of practice, so as to optimise conditions in which sustainable activities can take place, Dr. Cavalieri said. These include the creation of strict codes, against which companies can be audited and certified. “In principle these are positive developments, but they have raised some very difficult challenges for an industry that is made up predominantly by SMEs. Small companies, with limited human and financial resources, often struggle to meet the demands of compliance organisations, and many family-owned firms, which are ethical and often have been in the business for generations, find themselves being pushed aside by clients, simply because they are not certified as compliant,” Dr. Cavalieri continued. CIBJO, he said, has been working hard to provide solutions, and particular in the more fragile sectors of the jewellery business, like coloured gemstones, where almost all firms qualify as SMEs, even the mining companies. Its new Responsible Sourcing Blue Book provides a framework and guidance for ethically sourcing gems and precious metals responsibly in the jewellery sector, referencing the OECD’s Due Diligence Guidance for minerals from high-risk areas. “The philosophy that guided us in the creation of the Responsible Sourcing Book is that all participants in the jewellery business have a duty of care, and thus should conduct supply-chain due diligence to the best of their ability,” the CIBJO President said. “I strongly believe that, by committing to sustainability, our industry is able redefine the value proposition of our products in the public consciousness. Not only are they objets d’art and symbols of love and devotion, but they also are instruments that actively serve to create better and more sustainable societies” Dr. Cavalieri stated. “When consumers buy jewellery, they should feel that they are not only doing something for themselves and their loved ones, but for the world and society as well,” he said. 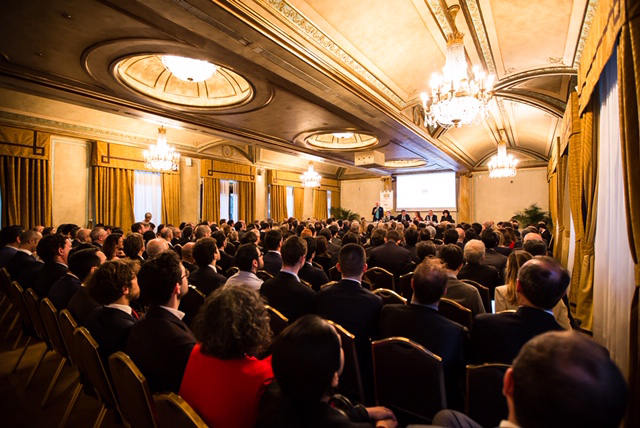 A view from the audience during the Conova Club meeting on sustainability in Milan on April 9, 2019.